50ml. to 500ml. Single Station / Four Cavity, Hydraulically operated Fully Automatic Plastic Extrusion Blow Molding Machine, with 4 cavity Auto De-flashing attachment. Suitable to make containers in Blow HDPE; LDPE; PP PVC Materials. MODEL: BE_H2000 DS/4H AUTO DEFLASHING. Suitable to make Plastic Articles in Blow HDPE; LDPE; PVC; PP; Raw Materials. Medical Pharmaceuticals (eye dropppers,tablet packing, saline /glucose bottles). Edible items (food & beverage products, oil cans) etc. Cosmetics (oil, shampoo, powder) etc. Agriculture (Bio Fertilizer, pesticides) etc. OTHER PRODUCTS:* CO EXTRUSION BLOW MOLDING MACHINE. * HIGH SPEED BLOW MOLDING MACHINE. * MULTI PARISON BLOW MOLDING MACHINE. * AUTO DEFLASHING BLOW MOLDING MACHINE. 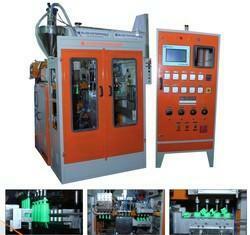 * CHEMICAL CONTAINER BLOW MOLDING MACHINE. * PHARMACEUTICAL / PESTICIDE BLOW MOLDING MACHINE. * CUSTOM MADE BLOW MOLDING MACHINE. * KIDS TOYS BLOW MOLDING MACHINE. * ACCUMULATOR BLOW MOLDING MACHINE. Looking for Auto Deflashing Blow Molding Machine ?